This information for a long time remained in my mind only as an unusual information. Behind the routine of life, I could not find her place in my articles, which, for the most part, were written on the instructions of the editorial board, until some time ago in one of the bookstores I came across an article about the Claddagh ring - Claddagh, and the legend about his appearance, and then I was able to fully admit in my mind that wild idea for me that the Irish really, like a living commodity, along with the black inhabitants of Africa, were sold into slavery. The design of the ring is very unusual. The crown symbolizes the one and true love, the heart - undying loyalty and devotion, and the two connecting hands is a symbol of true friendship, which, like cement, holds the hearts of true love for two. 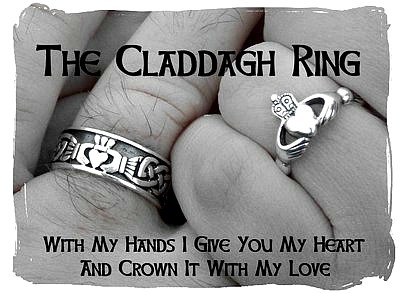 The Claddagh ring was soon worn by all Irish women, and often it was the only legacy in the family of fishermen that mothers could pass on to their daughters. In 1698, by decree of the English King George III, all the Irish, as subjects of the British Empire, enslaved, were given freedom, and finally the day came when Richard could return home. By this time he had become a famous jeweler and his former master did not want him to leave it. He offered Richard to marry his daughter and half his wealth, but Richard went to Ireland. In his native village, he found his beloved, who had faithfully waited for him all these years, and as a token of his and their love, Richard handed her a ring that she made in slavery with thoughts of their love. "What is common to all? Hope, because it has those who have nothing else." I think we should be grateful to History, which has preserved for us simply a striking example of the life of a spirit-strong man who, in slavery, did not lose faith in his love and hope for freedom. I so want to say - in THEIR love, but, unfortunately, I did not find in the sources the name of my beloved Richard, who faithfully waited for him all those long years, keeping all the same single hope. An example of the extraordinary life of Richard Joyce, a poor fisherman from the 17th century Irish village, and his love story with a happy ending, once again proves that only by our own efforts we create our own happiness that will inevitably come to us one day. If only we do not lose on the vital roads of our Faith, Hope and Love.